Sunlight Cooking is an initiative of SUREST International. This company develops sustainable energy solutions for sunny regions. SUREST International is a start-up company, established in Angeren, The Netherlands, which designs, develops and puts on the market efficiënt and cheap renewable energy solutions, using patented technology (patents pending). Since the summer of 2014 we have been supported and coached by the Climate KIC accelerator programme. SUREST International develops so called “revolving” energy solutions: This refers to the latin word volvere, which means to roll or to turn around (think about a revolver !). Our products can be re-used time and again and thus, contribute to a sustainable society (circular economy). To become a worldleader in efficient, cheap, rubust, small-scaled revolving energy systems which make use of sunlight. 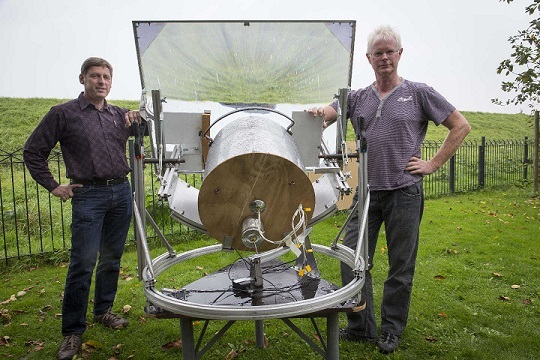 The founders of SUREST international in front of prototype 1 of the Sunlight Cooker. 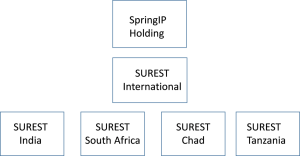 The limited liability company Spring IP will be the international holding company for our production and sales activities. In 2015 the operational company SUREST International will be founded, which is responsible for technology development, production, distribution and sales support of our international business. In each of the target countries a daughter company will be established, e.g SUREST South Africa, SUREST India, SUREST Chad, SUREST Tanzania, etc, which will be responsible for the imports, storage, assamblage, sales promotion and local distribution of SUREST products. In a later stage other sustainable products will be manufactured and marketed via the same channels.